Not a Drop to Drink is the type of novel that would have never appeared on my radar if it were not for the enthusiasm of dozens of bloggers. In fact, I believe this is one of the few dystopian novels I've picked up since my string of disasters with debuts last year, so color me surprised to find that McGinnis manages to do this genre justice. Not only is her debut gritty and realistic, but it combines one of the best aspects of dystopia that seem to have been buried under endless love triangles - fear. One of the primary reasons that dystopia became a favorite genre of mine was precisely because it lent itself so beautifully to psychological development; understanding how the fear of a future world led its people to behave in such inhumane ways. Not a Drop to Drink captures this dilemma perfectly, all without the eyesore of a love triangle or the burden of a mindless protagonist. If that isn't fortuitous, then I don't know what is. As its title suggests, Not a Drop to Drink takes place in a futuristic world where water is a scarcity. Lynn has grown up in the middle of nowhere, far away from cities and other proper means of civilization, choosing to live with her mother in their small house with their small treasure. And by treasure I mean water. With water such a rarity in this world, Lynn has been forced to fight for her pond and, from a young age, has been taught by her mother how to shoot and just when to kill. In other words, shoot on sight, make no friends, and survive. When Lynn's mother is killed, though, Lynn slowly finds herself opening up to others surrounding her, but as her heart opens, so does room for danger as well...Not a Drop to Drink is a largely plot-less novel, but that is far from being a detriment. While I found it to have an unusually slow start, it swiftly picked up and I found myself immersed in Lynn's life. McGinnis does a brilliant job of portraying the harsh brutality of the world Lynn has grown up in and we are witness to the prickly thorns surrounding her walls as she fails to connect with those around her. Lynn finds Lucy, Eli, and Neva - a young family searching for water - and with the help of her neighbor Stebbs, slowly grows to envelop them in her life. McGinnis never rushes Lynn's growth, taking her time to make her feel comfortable with strangers and re-connect with her humanity. One of the largest themes of this novel is that of life vs. survival. 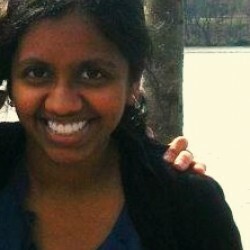 From the moment she was born, Lynn has simply been surviving. Her mother, a heard-hearted woman whose circumstances turned her to steel, never let Lynn feel the brunt of gentle emotions. Thus, Lynn has a long way to travel, psychologically, before she can learn to see people and not enemies, before she can learn to trust instead of kill. I love that this is not only a far cry from the typical overbearing governments that litter dystopias, but this is also a much more realistic portrayal of a futuristic conflict. McGinnis writes beautifully and the details of her world fit in like puzzle pieces into the story. Although the main focus of this novel is on Lynn, there is still a depth of world-building that is slowly revealed over the course of the novel, as well as a plethora of other mysteries that begin to show by the end. Unfortunately, I found this was a detriment to the novel as, frankly, there was simply too much piled on to that conclusion. For once, the epilogue was mildly satisfying, but beyond that, the quick succession of events towards the end lost any real impact those concluding scenes may have had. Moreover, the characterization of many of the secondary characters was ever-so-slightly disappointing. None of them had the level of depth that Lynn or her mother possessed, and while this didn't impact my enjoyment of the novel in any particular manner, I would have loved for those other characters to come alive for me the way Lynn did. Nevertheless, if you've lost belief in the dystopian genre, then this novel is the one to restore your faith. 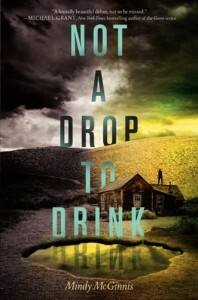 Not a Drop to Drink is an engaging thriller, full of concise prose and vivid characters. You'll come away from this with a far better appreciation of dihydrogen monoxide than before and, most likely, a thirst for more solid stand-alones from this genre. If nothing else, McGinnis has proved to be an author to watch out for and I can only hope she continues to belt out winners.